Synopsis, Our Opinion: This wine has to be the all-time quintessential Cabernet Franc. Producer/Winery: Catherine & Pierre Breton; Restigné, France. Geographic Appellation, Region, Country: Bourgueil; Loire Valley, France. Opened one hour before drinking. Clear, but very dark purple with a light pink rim. Intense aromas of dense wood smoke, ashes from last nights fire, bell pepper, ripe cherry and hints of a trellis full of “Autum Sunset” Roses at the beginning of the bloom. Smooth, bone dry, refined, medium weight body and a 200-grit texture. 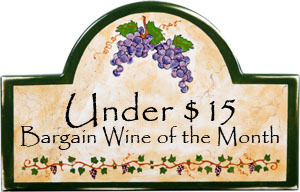 Prominent flavors of compacted ripe cherry, blackberry and cardamon set on a chalky background. Fresh acidity, fine grain tannins and a long slightly bitter fruity finish. WOW, WOW, WOW this was unsurpassable Cab Franc. Fantastic aromas; depth; solid, yet smooth mouth-feel; classic Cab Franc taste and a finish that screams…take another sip!!! It’s one of those awesome wines that paired perfectly with the dinner and than what’s left in the bottle is sipping wine you wish would never end. 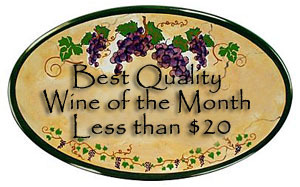 Not inexpensive, but the quality is so outstanding it’s a STELLAR value. This wine has to be the all-time quintessential Cabernet Franc. Comments: Learn more about Catherine and Pierre Breton and their wines. 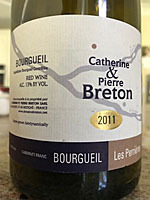 See also: our review of other Catherine and Pierre Breton wines.